The most recent partial government shutdown of December 2018 and January 2019 was the longest in history, lasting thirty-five days and costing the U.S. GDP an estimated $11 billion, with $3 billion never to be recovered. Among its victims were 800,000 federal government employees who were forcibly furloughed or worked like chattel as well as countless small businesses, the stock market and (perhaps worst of all) the American wine industry. As this magazine predicted, the political dimensions surrounding the legislative gridlock were certain to make this a lengthy shutdown and while it may have been declared dead with the signing of H.J. Res. 28 by President Donald Trump on Jan. 25 its catalytic issue, the dispute over the proposed border wall, has not yet been put to rest. Because of this, the record- breaking shutdown recently endured by the American people is likely a mere preliminary event to the crisis yet to come. In order to comprehend the potentially disastrous consequences of a breakdown in border wall negotiations before Feb. 15, when the funding appropriated by the continuing resolution expires, it is important to understand the psychology of the dispute’s two parties. First, Donald Trump stands to lose the most from this protracted battle. Since his campaign largely revolved around the border wall issue he staked his political reputation on the success of the shutdown strategy. Indeed, his apparent backtracking has drawn heavy criticism, with Republicans in Congress distancing themselves from him and once staunch allies claiming that the President “blew it” by agreeing to end the shutdown when he did. Furthermore, the Trump base which typically acts as a source of relief for the President is vehemently demanding that he fulfills his perennial promise, prompting some symbolic support from Trump on other issues to ease dissatisfaction. Ever bombastic, Trump is not likely to take this loss quietly and with political analysts claiming that the move has put his chances at reelection in jeopardy, the President is sure to use the impending events to force his agenda or find a suitable alternative to push forward his border security policy. The Democratic majority House of Representatives also has much to lose should the government see another devastating shutdown in February. While largely seen as the winners of this skirmish, shifting blame has many voters in key states holding Democratic lawmakers responsible for government paralysis, thereby endangering their chances for a successful 2020 performance. Furthermore, the spotlight has shifted to the Democrats as they are understood to be the chief obstacle to the Administration’s border security policy, especially in light of President Trump’s quasi-compromise of accepting a semantically different but politically similar “steel barrier” in lieu of the anticipated “concrete wall.” While firmly advocating for their ideological principles, the Democrats know that they will eventually be forced to compromise and hold the burden of doing so before the issue spirals out of control. With political partisanship at all-time highs and Congress emerging from the shutdown more gridlocked than ever, a satisfactory compromise may not come in time to meet impending deadlines that threaten the wellbeing of the country. Should the negotiations over border wall funding stall or collapse, the government may shut down again come Feb. 15. This second shutdown will be markedly different from the first in that its effects will be more severe and its resolution more pressing. Whereas before the government had ample time to drag out the fiscal debate, the impending issue of the debt ceiling must be addressed by Mar. 1st, making a quick agreement essential to the economic health of the nation. While the new Democratic House rules facilitate the augmentation of the debt ceiling by automatically including language to that effect in any appropriations bill, if no bill comes into being such a provision is moot. In this scenario the Treasury is expected to use extraordinary measures to delay the debt ceiling’s hard deadline to mid-summer, however, if a consolidated appropriations bill is not passed by March markets are likely to react negatively to the uncertainty of U.S. debt commitments. Such a reaction would, in turn, affect the economy as a whole and may even cause a recession which would prove catastrophic to both the domestic and international economies and intensify popular clamors for reform as the renewed shutdown begins to affect the personal finances of all Americans. With that being said, Donald Trump may not let the government go to another shutdown, being acutely aware of the toll the last one took on his approval ratings and himself heavily invested in a successful U.S. economy, both personally and politically. Instead, he may go further. The President has already expressed interest in declaring a state of emergency at the southern border and marshaling funds in order to address it with his staff being busy drafting an executive order style proclamation to that effect. 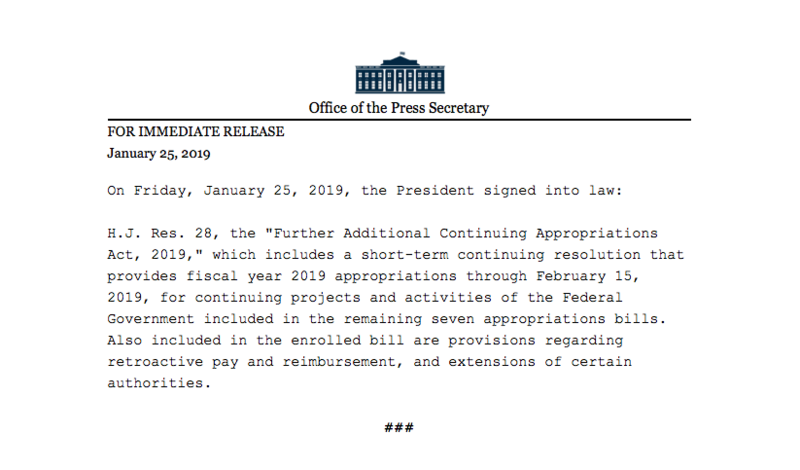 By invoking his authority under the National Emergencies Act the President would theoretically be able to begin construction on the border wall without Congressional approval or oversight, with an estimated $7 billion liable to be diverted from military construction funds and disaster relief reserves. While it may not be a decisive win, such a Frank Underwood-style ploy could see substantial gains and provide the incumbent with potent ammunition in 2020, presenting himself to his supporters as a man who tried every avenue against all odds. More alarming is that such a move poses a danger to American liberties that could engender a constitutional crisis or provide a precedent for future usurpations of power. Most analysts agree that Trump could legally declare a national emergency as per the powers delegated to the President. While many envision court challenges to stay his hand, it must be remembered that the Supreme Court has already sanctioned controversial Trump policies, most notably the so-called Travel Ban in 2017 whose authorization came before Trump added yet another sympathizer to the highest bench. As for the lower courts, their staying power revolves around the issuance of nationwide injunctions to block ostensibly unconstitutional exertions of executive power. However, the nationwide injunction power is not universally recognized by legal professionals, and should Trump press forward with the initiative despite these injunctions he will have ample time to break ground considering that even the most high profile cases (e.g., New York Times Co. v. United States and Bush v. Gore) take at least a month to reach the High Court. Furthermore, with Congressional review of national emergencies happening every six months and with border wall construction estimated to take only eighteen months, Trump would have a fait accompli before Congress is able to stop him. Such a scenario would call into question the power of the Presidency and could lead to a fundamental constitutional crisis in this country. Such a situation that would be just as disastrous as other hypotheses around the abuse of the National Emergencies Act. While it is unlikely that Trump will become the next Sulla, and while Congress has taken some steps towards compromise, the impending deadline and ghastly possibilities make the border wall issue a paramount concern. With the press lambasting Trump as having “conceded” and “caved” last week and with the President already calling negotiations a “waste of time,” Trump is likely to exhaust all options to achieve the essential border wall win and restore his reputation. Whatever uncertainties remain concerning the future of the border security debate what is sure is that should any of these possibilities occur the last government shutdown will be remembered not as a historical event but merely as a momentary respite in an era of political turmoil.